Utah Ski Resorts Pump Cash Into Areas Hoping For Payoff - Ski. Play. Live. The irony isn’t lost on locals. Four miserable winters (comparatively) and yet Utah ski resorts spent millions on “improvements” this summer, while raising the cost of lift tickets yet again, all in the hopes of attracting more visitors. Don’t they know by now that we skiers are all about deals? I’d rather have the option of brown-bagging it for a $50 lift ticket than spending $100 because there’s a shiny new lodge or snowmaking equipment that needs to be reimbursed. That said, Utah skiers can expect to see some major alterations to the Wasatch Front landscape this 2015/16 ski season. This was a HUGE year for construction and retooling. 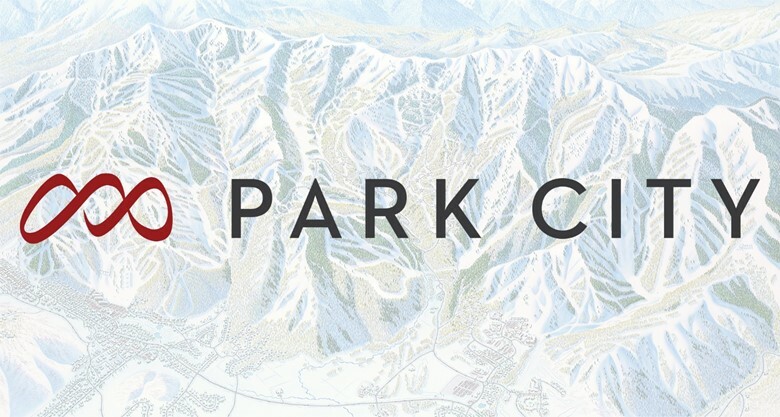 You would have been living in a cave in the North Pole not to have heard about the conjoining of Park City Mountain Resort and Canyons into one massive area now named “Park City Mountain” and “Canyons Village at Park City”. The area(s)’ owner, Vail Resorts, plunked down $50 million dollars to transform Park City into “the largest resort in the United States.” Not that anyone would actually want to spend more than half of their day skiing between the resorts (cabriolet, three lifts and two gondolas, with only one intermediate run to be had through it all) just to get from Canyons to PC) but, whatever, there will now be 7,300 skiable acres for one lift ticket or season pass price ($789 and $101, respectively). The folks it’ll suit best are intermediate skiers who start at Park City and want to spend the night at Canyons or ride their zipline. Or perhaps people staying in Park City who want to backcountry ski because you can only do it from Canyons. Think Whistler/Blackcomb not Alta/Bird. In addition to the Quicksilver Gondola that links the two areas, PCM’s King Con Chair is now a six-pack, The Motherlode lift is now a detachable quad, “Miners Camp” replaces the Snow Hut Lodge- 500 indoor seats (yay! ), a large deck and fresher food choices like homemade soups, made-to-order sandwiches and tossed salads- and the Summit House has been remodeled to increase seating; the Red Pine Lodge has a new, upper deck and 250 more indoor seats, and they’ve added snowmaking on two trails in the Iron Mountain area to handle increased skier traffic for Quicksilver Gondola access. The next big spender was Snowbird Resort with $35 million dollars in capital improvements. Hidden Peak is finally crowned with the Summit Lodge. Guests can dine surrounded by a spectacular, 360-degree-view from 11,000 feet. The two-story glass-enclosed structure replaces the modified port-a-John that housed Snowbird’s elite Ski Patrol. 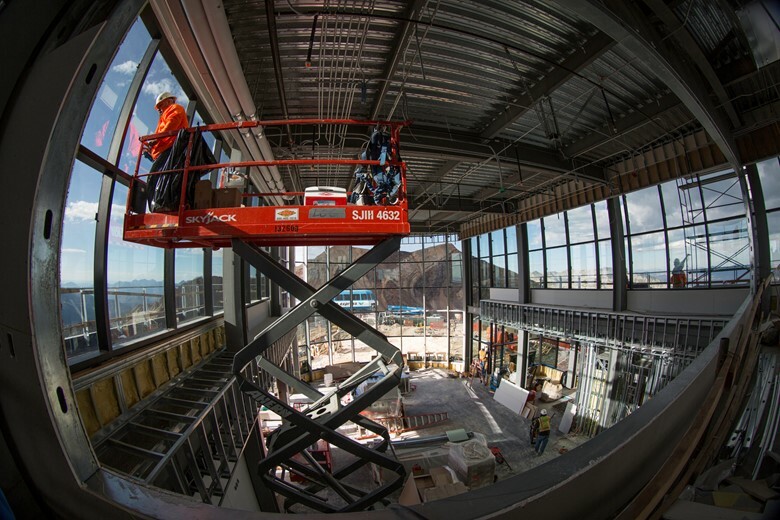 The new 23,000 square foot building will have cafeteria seating for 192 people on the first floor, a private dining room for 180 guests, restrooms, a coffee/pastry shop, a 10,000 square foot deck and a new Ski Patrol headquarters. Patrons of the Cliff Lodge waved good bye to those quirky windowed-showers in 350 guest rooms in the east wings. The remodel includes carpeting, marble counters and tile in the bathrooms, ergonomic mattresses, contemporary furnishings and entertainment systems, energy efficient lighting and upgraded Wi-Fi. No more wire wickets. Following in Alta’s footsteps, RFID has come to the Bird. The Bird plans to extend the ski season in Peruvian Gulch, Gad Valley and Mineral Basin by adding more snowmaking guns to those areas. Then comes Deer Valley and Solitude. 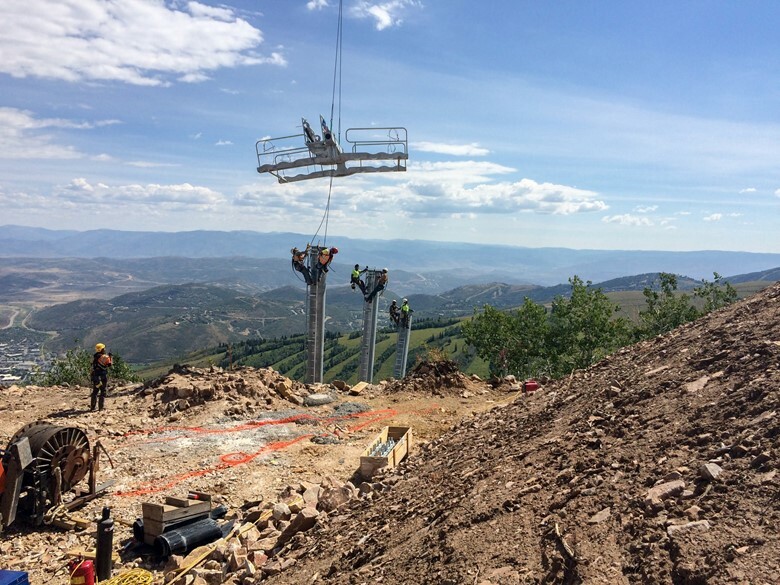 DV officially took ownership of the Big Cottonwood Resort in May 2015 and immediately began ripping out the aged Summit fixed-grip double chairlift. They installed the new, four-person detachable high-speed Summit Express chairlift and added a new ski run from the top of the existing Apex Express chairlift to the bottom terminal of the new, realigned Summit, significantly lessening the current travel time to Honeycomb Canyon. So now you can access Honeycomb without freezing and falling asleep. You’ll still have to ride two lifts to get back to the base of Summit but at least they are now all high speeds. When you’re ready to eat expect that Deer Valley Difference in the remodeled Moonbeam Lodge Restaurant. In fact, DV revamped the menus at all of the resort’s restaurants. Brighton made the best move of all. They’re celebrating their 80th anniversary by bringing back their extremely popular ‘kids 10 and under ski free’ deal. Smart families will be packing that brown bag and heading up BCC a lot this winter. Utah’s newest resort, Cherry Peak Resort, is planning for their inaugural season this December. The Northern Utah area 15 miles from Logan features three triple chairlifts, a comprehensive snowmaking infrastructure and a 1.25 mile-long-run. They didn’t have enough snow to open last season so fingers crossed for something better soon. The resort has an impressive three-story day lodge for year-round events. Feel like having a mountain all to yourself? Rent-a-Resort at Eagle Point, south of Salt Lake City, is available for private rental Tuesday through Thursday, January 5 – April 3. This looks amazing! I’m so excited for it be finished so we can ski there in the upcoming winters. We love skiing at my house. So fun and exciting! Interesting read. I’ve never been big into skiing, but it’s interesting how much $$ is involved with it all in the hopes to draw more people, yet snow is key! lol Here’s hoping for a better winter!